Earlier this week I attended the Open Source Junction Context Aware Mobile Technologies event organized by OSS Watch. Due to a prior engagement I missed the second day and had to leave early to catch a train. It was a pity as the programme was excellent and there was some terrific networking opportunities, although it sounds like I was fortunate to miss the geocaching activity which the twitter feed suggested was very wet and involved an encounter with some bovine aggression. During the first two sessions I did attend there were quite a few people, including myself, talking about the mobile web approach to app development. I made the comment that the whole mobile web vs. native debate was fascinating and current and that mobile web was losing. But everyone seemed to agree that apps are a pretty bad deal for developers and that making any money from this is about as likely as winning the lottery. 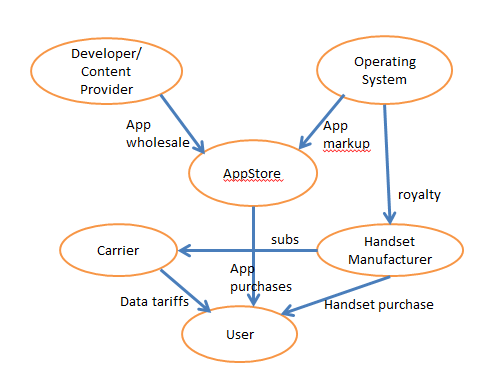 This got me thinking on the train to Edinburgh about the “App ecosystem” and what that actually means. A very brief Google search did not enlighten me much so I sketched my own App food chain, shown below. It no surprise that the user is right at the bottom as all the energy that flows through this ecosystem comes from the guy with the electronic wallet. But I think it’s going to be a bit of a surprise for app developers ( content providers ) to see themselves at the top of this food chain (along with Apple and Google) as it doesn’t feel like you are king of the jungle when the App retail cut is so high and prices paid by users is so low. It will be interesting to see if Google, who are not happy with the number of paid apps in the Google Marketplace cut the developer a better deal. Or if the Microsoft Apps built on top of Nokia try to gain market penetration by attracting more high quality content. My guess is not yet. The problem for developers is that the App retailers can grow at the moment just by the sheer number of new people buying smartphones. This is keeping prices artificially low and means app retailers are not competing all that much for content. But smartphone ownership is in fact growing so fast that pretty soon ( approx 2 years?) everyone who wants or can afford a smartphone is going to have one. How do app retailers grow then? They are going to have to get users to part with more money for apps and content either by charging more or attracting advertsing revenue. Even though there are a lot of app developers out there, apps users will pay for are scarce and retailers are going to have to either pay more to attract the best developers and content to their platform, or make life easier for content providers by adopting open standards. So maybe the mobile web might emerge triumphant after all. nice drawing, illustrates the ecosystem perfectly..